UPDATED: Sat., April 14, 2018, 9:03 p.m.
SEATTLE – As a member of the University of Washington’s elite women’s varsity crew, Eliza Dawson honed her athletic skills on the sometimes-choppy waters of Lake Washington. Dawson is taking part in a 2,400-mile rowing race from Monterey, California, to Honolulu. She and three teammates are aiming to break a world record – 50 days, 8 hours, 14 minutes, set in 2014 – for a women’s rowing team. Dawson and her three teammates will begin rowing across the Pacific Ocean on June 2. She plans to post updates on her personal blog, row4climate.com and on her team’s blog, rippleeffectrowing.com. But they also want to put a spotlight on the far-reaching impacts of humankind on the Earth by rowing across parts of the Great Pacific Garbage Patch – a vast gyre of pulverized plastic garbage occupying an area roughly four times the size of California. Dawson, who studied atmospheric sciences at UW and will begin working on her doctorate at Stanford University this fall, plans to send photos and videos of the garbage patch. She hopes to record the journey on her blog and the team’s blog as she goes. “It’s going to be a hard, demanding journey – and that’s what it’s going to take to combat climate change,” said Dawson, 22, who was a member of the UW crew in 2016 and 2017. The four women will alternate two hours of rowing with two hours of sleep for 40 to 50 days. They’ll be rowing a specially designed oceangoing rowboat they’ve named the Ripple Effect. Their journey is part of the third Great Pacific Race, organized by New Ocean Wave. It involves eight teams of rowers crossing the Pacific. They are the only all-women team in the race. Dargan Frierson, an associate professor of atmospheric sciences at UW and one of Dawson’s former professors, described Dawson as “the type of person who tries to do things that seem impossible. 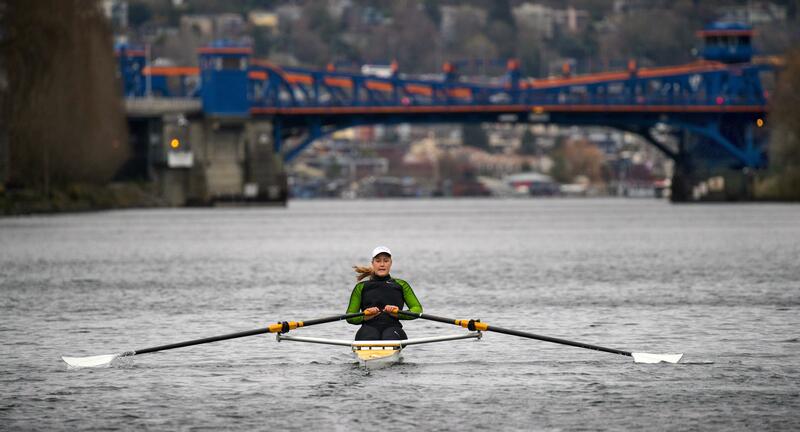 One day last week, Dawson and her coach, Conal Groom of the Seattle Rowing Center, carried a one-person shell out onto the water east of the Ballard Bridge. Dawson sat on the small seat and rowed the sleek shell past a line of battered commercial-fishing boats with names like Determined, Aleutian Challenger, Sea Venture and Botany Bay. The race will hinge on things that are beyond her team’s control – weather, currents, waves. “And luck,” Groom said. Dawson has only met one of her teammates in person. Two are from Great Britain, and one is from Brazil. They connected over the internet. They’re coordinating the trip via Skype calls. Dawson has displayed a seriousness of purpose and fascination with the natural world that impressed adults when she was just a kid, growing up in Port Townsend, Washington. When she was 10 years old, she and her sister, Chloe, began volunteering at the Port Townsend Marine Science Center, where the girls met Libby Palmer, its co-founder. Palmer was struck by Dawson’s maturity, and her ability to do sustained, concentrated work. Finding a fully intact orca carcass on a beach is rare – the mammals usually sink in open water when they die. Research revealed that the dead orca was heavily contaminated with toxins. “That was a wake-up call for me,” Dawson said. She’d grown up sailing and rowing in what seemed like the pristine waters around Port Townsend. How could a whale living in those same waters be full of toxins? The orca project sparked a growing interest in how the ocean was being changed by acidification and carbon dioxide. Frierson, the UW professor, met Dawson when she visited his lab as a high school student. He hopes students and faculty in atmospheric sciences will be able to aid Dawson’s journey – giving the team a heads-up about upcoming weather and other details like projections of wave heights. In her doctoral program at Stanford, she plans to study why the Antarctic ice sheets are collapsing and what effect the retreating ice could have on sea levels. Dawson is confident in the boat, which has two small cabins for resting and sleeping, and two seats for the rowers. An emergency vessel will be in the area, and a helicopter could airlift a rower to safety if the worst happened. The boat will contain food for the trip, most of it dehydrated, and it is equipped with a desalinator to make potable water out of seawater, along with a GPS tracking device and a satellite phone. Published: April 14, 2018, 8:58 a.m. Updated: April 14, 2018, 9:03 p.m.